A.K.A. Justin's birthday cake. He asked for it. He got it! There is a little Italian deli not too far from home that makes a really good coconut cake. We go there to eat and make sure we save room for dessert. And sometimes we don't save room so we get a slice of cake to go. Since we like that cake so much, it was time for me to make one myself. I followed the recipe, then deviated when it came to the frosting. After each taste-test lick from the beaters, I knew this one was a keeper. 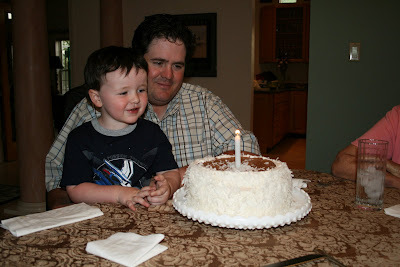 The cake was nice and tender, spongy, light. The coconut frosting was very mild. The chocolate frosting was rich. It was a great combination. 1. Preheat oven to 350°F. Cut out circles of parchment paper to fit your pans. Place in bottom. Grease and flour three 9-inch-diameter cake pans. 2. Mix flour, baking powder, baking soda and 1/2 teaspoon salt in medium bowl to blend. Set aside. 3. Using electric mixer, beat sugar, butter and sweetened cream of coconut in large bowl until fluffy. 4. Beat in egg yolks and vanilla extract. 5. On low speed, beat in dry ingredients and then buttermilk, each just until blended. 6. Using clean dry beaters and a fresh bowl, beat egg whites with a pinch of salt until stiff but not dry. Fold egg whites into batter. 7.Divide cake batter between prepared pans. 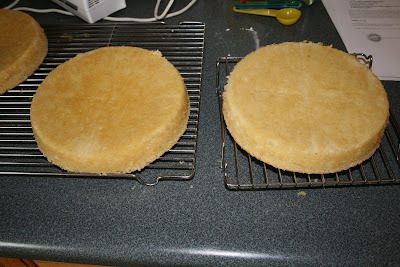 Bake cakes until tester inserted into center comes out clean, about 25 minutes. 8. Cool cakes in pans on rack 10 minutes. Run small sharp knife around pan sides to loosen cakes. Turn cakes out onto racks and cool completely. I was so busy mixing and folding, I forgot to take pictures of these steps. 2. Add vanilla. Beat. Add sugar, one cup at a time. 3. 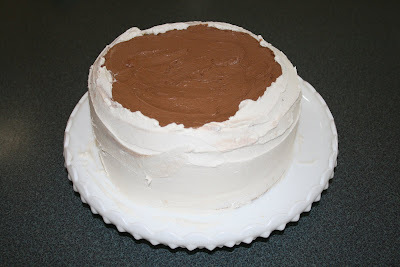 Divide the frosting in half. Set aside one half, keep the other half in the mixing bowl. 4. 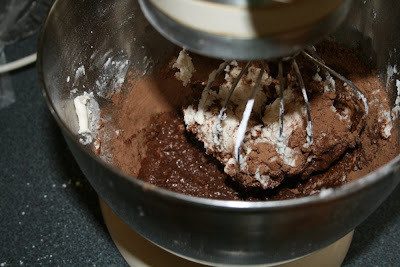 To make chocolate buttercream, add the cocoa powder and milk to the frosting in the mixing bowl. Beat on medium speed until smooth and fluffy. Set aside. 5. To make coconut buttercream, using anther bowl and clean beaters, add the cream of coconut to the reserved frosting and beat until smooth and fluffy. 1. 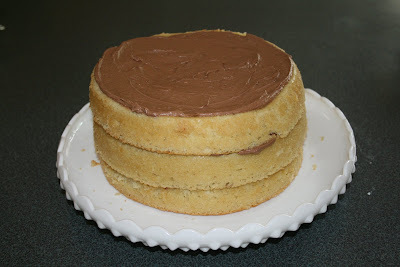 Place one cake layer on a pedestal. Spread 1/3 of the chocolate frosting over top. 2. Repeat for the next two layers. 4. Press flaked coconut into the sides. 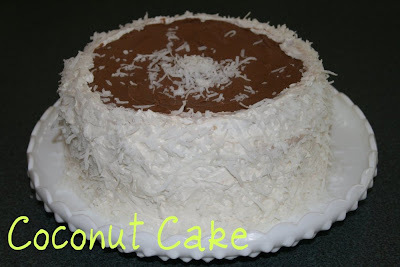 If desired, sprinkle some coconut on top. 5. Tidy up the cake pedestal and serve.